In 2007 and 2009, the question was altered to ask about grocery stores and drug stores within 15 minutes of the household, thereby changing the unit of measurement from distance to time. The 2013 AHS was improved to include a wider range of questions about grocery stores, presumably because of growing national interest in the issue. 2013 data distinguishes between “full-service grocery stores” and “convenience stores” within 15 minutes of the household. Professor Doug Hess, in Political Science/Policy Studies, recently found that these data had not been analyzed in depth. I worked on this data for a MAP last summer and continued working on it this year. I will be presenting my data at the Midwest Political Science Association conference in Chicago next month. Using the 2013 data, I created three models that use logistic regression to identify characteristics that predict limited access to grocery stores. 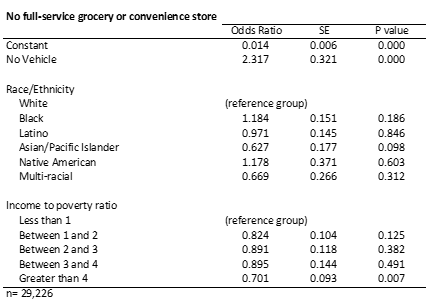 The models examine the following outcome variables(all measuring within 15 minutes of the respondents’ home: no full-service grocery store, only a convenience store, and neither a full-service grocery store nor a convenience store). The models include predictors identifying several socioeconomic characteristics (only race and the ratio of income to poverty are discussed here). The results of my models confirm what prior research using different data found about the relationship of race and income to store access. All non-White race and ethnicity categories are less likely to have a full-service grocery store within 15 minutes of their household. Non-Whites are also more likely to say that they only have a convenience store nearby. Income as a ratio to the poverty threshold produces a pattern in all three models’ results. 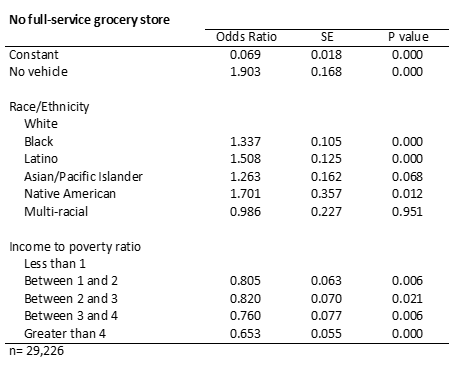 Those in the lower-income categories are more likely to report that they do not have a full-service grocery store, only have a convenience store, or do not have either store nearby. Households that do not have a vehicle are much more likely to not have a grocery store and to only have a convenience store nearby. These households were also more likely to not have either type of store within 15 minutes, which could be a very burdensome situation as vehicles are the primary mode of acquiring groceries. Research is beginning to look at the variety in quality of grocery stores, in terms of the healthfulness of the products they sell, and the 2013 AHS provides a crucial first-glance at the inequality of access that exists in America today. Hopefully, in the near future, the AHS will expand their questions about grocery store access, more research will be done, and policy in the U.S. will change to reflect the seriousness of this issue and begin to resolve the current situation. (Bodor et al., 2010; California Center for Public Health Advocacy, 2008; Carroll-Scott et al., 2013; Drewnowski et al., 2012; Larson et al., 2009; Ver Ploeg, et al., 2009). Baker, Elizabeth A., Mario Schootman, Ellen Barnidge, and Cheryl Kelly. “The Role of Race and Poverty in Access to Foods That Enable Individuals to Adhere to Dietary Guidelines.” Preventing Chronic Disease3 (2006): 1-11. Web. Beaulac, Julie, Elizabeth Kristjansson, and Steven Cummins. “A Systematic Review of Food Deserts, 1966-2007.” Preventing Chronic DiseaseA105 6.3 (2009): 1-10. Web. Bodor, J. Nicholas, Janet C. Rice, Thomas A. Farley, Chris M. Swalm, and Donald Rose. “The Association between Obesity and Urban Food Environments.” Journal of Urban Health5 (2010): 771-81. Web. California Center for Public Health Advocacy, PolicyLink, and the UCLA Center for Health Policy Research. Designed for Disease: The Link Between Local Food Environments and Obesity and Diabetes. April 2008. Carroll-Scott, Amy, Kathryn Gilstad-Hayden, Lisa Rosenthal, Susan M. Peters, Catherine Mccaslin, Rebecca Joyce, and Jeannette R. Ickovics. “Disentangling Neighborhood Contextual Associations with Child Body Mass Index, Diet, and Physical Activity: The Role of Built, Socioeconomic, and Social Environments.” Social Science & Medicine95 (2013): 106-14. ScienceDirect. Web. Drewnowski, Adam, Anju Aggarwal, Philip M. Hurvitz, Pablo Monsivais, and Anne V. Moudon. “Obesity and Supermarket Access: Proximity or Price?”American Journal of Public Health8 (2012): E74-80. Web. Dutko, Paula, Michele Ver Ploeg, and Tracey Farrigan. “Characteristics and Influential Factors of Food Deserts”, ERR-140, S. Department of Agriculture, Economic Research Service, (2012). Web. Galvez, Maida P., Kimberly Morland, Cherita Raines, Jessica Kobil, Jodi Siskind, James Godbold, and Barbara Brenner. 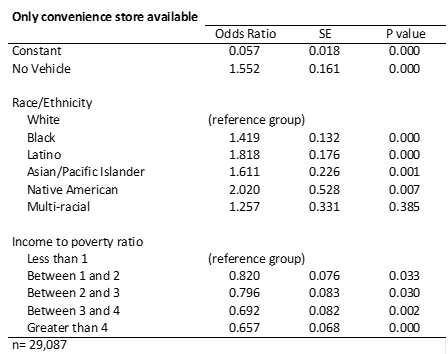 “Race and Food Store Availability in an Inner-city Neighbourhood.” Public Health Nutrition06 (2008): 624-31. ScienceDirect. Web. Larson, Nicole I., Mary T. Story, and Melissa C. Nelson. “Neighborhood Environments: Disparities in Access to Healthy Foods in the U.S.”American Journal of Preventive Medicine1 (2009): 74-81.e10. Web. Moore, Latetia V., and Ana V. Diez Roux. “Associations of Neighborhood Characteristics With the Location and Type of Food Stores.”American Journal of Public Health 2 (2006): 325-31. Web. Morland, Kimberly, Steve Wing, Ana Diez Roux, and Charles Poole. “Neighborhood Characteristics Associated with the Location of Food Stores and Food Service Places.”American Journal of Preventive Medicine 1 (2002): 23-29. Web. Powell, Lisa M., Sandy Slater, Donka Mirtcheva, Yanjun Bao, and Frank J. Chaloupka. “Food Store Availability and Neighborhood Characteristics in the United States.” Preventive Medicine3 (2007): 189-95.ScienceDirect. Web. Sharkey, Joseph R., Scott Horel, and Wesley R. Dean. “Neighborhood Deprivation, Vehicle Ownership, And Potential Spatial Access To A Variety Of Fruits And Vegetables In A Large Rural Area In Texas.” International Journal Of Health Geographics(2010): 26-52. Academic Search Premier. Web. Sharkey, Joseph R., Scott Horel, Daikwon Han, and John C. Huber. “Association between Neighborhood Need and Spatial Access to Food Stores and Fast Food Restaurants in Neighborhoods of Colonias.”International Journal of Health Geographics1 (2009): 9. Web. United States Department of Agriculture-Economic Research Service (USDA-ERS). Food & Nutrition Assistance. By Alisha Coleman-Jensen, Christian Gregory, and Matthew Rabbitt. USDA ERS. Web. 10 Mar. 2015. Ver Ploeg, Michele, Vince Breneman, Paula Dutko, Ryan Williams, Samantha Snyder, Chris Dicken, and Phil Kaufman. “Access to Affordable and Nutritious Food: Updated Estimates of Distance to Supermarkets Using 2010 Data”, ERR-143, S. Department of Agriculture, Economic Research Service, (2012). White House, “First Lady Michelle Obama on Making a Difference in Cities with Food Deserts.”Let’s Move. 09 July 2014. <http://www.letsmove.gov/blog/2011/10/28/first-lady-michelle-obama-making-difference-cities-food-deserts>.